I was recently contacted by Collective Bias & Tyson to participate in a campaign to introduce Tyson’s new “ Tyson Grilled & Ready Chicken Breasts Fillets & Strips”. Since I am already familiar with the excellent quality of Tyson chicken products, I was delighted to accept their offer to do a review of their new product! For agreeing to be a participant in this campaign, Collective Bias & Tyson are providing me a $50 gift card for my own personal use and 10 “free product” coupons to give away! Two lucky winners will each receive 5 of these coupons! I’m sorry I do not have a picture of the coupons to share with you. They will be sent directly to the winners by Collective Bias & Tyson. But I”m sure you will be very pleased to win them! After all, everyone loves “free” stuff! You will find information on how to enter the giveaway at the bottom of the page! 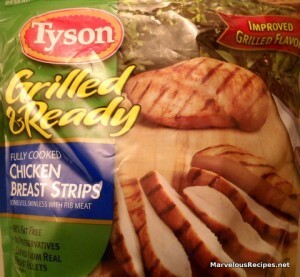 I had no trouble finding the “Tyson Grilled & Ready Chicken Breasts Fillets & Strips“. They were readily available in the freezer section at my local WalMart shopping center. I decided to use the “Tyson Grilled & Ready Chicken Breast Strips“, since I had planned to make chicken wraps for dinner one evening and I thought the strips would be perfect for wraps. I especially liked the resealable packaging which allowed me to remove only the amount of “Tyson Grilled & Ready Chicken Breast Strips” I needed to use and kept the remaining chicken strips fresh for later use. According to the package information, “Tyson Grilled & Ready Chicken Breast Strips” are 98% fat free with only 1.5 grams of fat and 100 calories per serving. Each serving also provides 19 grams of protein with no preservatives and are gluten free. The “Grilled & Ready Chicken Breast Fillets” are also 98% fat free with 1.5 grams of fat, 110 calories, and 24 grams of protein per serving. For those of you who are trying to take off a few pounds, they would make a delicious addition to your weight loss menu! The chicken strips were incredibly easy and quick to prepare! I simply heated them in the microwave for about 3 minutes and they were hot and ready to use! I found the meat to be very lean, tender and juicy with a wonderful “right off the grill” flavor that my hubby really liked. He’s a big fan of grilled meats! I would also recommend them for use in pretty much any recipe that calls for cooked chicken such as, soups, stir-fry or casseroles. The “Grilled & Ready Chicken Breast Fillets” would be perfect for making chicken club sandwiches or as an entrée served with your favorite vegetables such as mashed potatoes and green beans! I placed shredded lettuce, chopped tomato, Tyson’s Grilled & Ready Chicken Breast Strips (microwaved for about 3 minutes), crisp cooked bacon and shredded cheddar cheese in the middle of a warm, 10-inch flour tortilla, drizzled ranch dressing on top, folded the bottom of the tortilla up, then wrapped the sides around the ingredients. They were yummy! There are so many possibilities with these super-quick-to-fix chicken strips! My son likes to eat them for a snack. He just pops them in the microwave for a few minutes, sprinkles Mexican blend cheese on top, lets the cheese melt and enjoys them just the way they are! His girlfriend likes to dip them in salsa! I like to add them to garden salad with my favorite dressing! Fully cooked and ready to eat in minutes “Tyson Grilled Meats” go from freezer to table in just minutes. Perfect for those “extra busy” days when your family wants dinner in a hurry! If you and your family enjoy the delicious taste of grilled chicken but don’t always have the time to prepare it, you really must try the new “Tyson Grilled & Ready Chicken Breast Fillets & Strips”! If you would like to enter the giveaway for a chance to win 5 “free product” coupons from Tyson, just leave me a comment. Your name will be added to the pot and my son Matthew will be drawing the names of two lucky winners! The giveaway will end on May 31st at 12:00 midnight! Please include a way for me to contact you in your comment. I will be announcing the winners on June 2nd! Good luck everyone! Good morning Emily. I already like Tyson chicken but truthfully do not buy that much. I would love to win coupons. 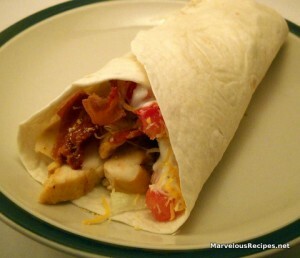 The wrap and recipe is easy and looks so good. I hope I am lucky. smile. How fun for you to be asked to participate in this! The wrap looks really tasty. Great job! This isn’t the sort of thing I normally go for, but I wouldn’t mind giving it a try. My family eats a lot of chicken. I would love to win free coupons for Tyson chicken. Your recipe looks good and easy to prepare. I like to use these strips in salads. I eat chicken all the time!! Thanks for the info. What a fun give away!! I love Tyson products, too! Larry smoked some Tyson baby back ribs yesterday, and they were excellent!! Please enter me in the drawing! I’ve got my fingers crossed. Can I share about your drawing on Friday on my blog? I know others would love a chance to win!! Glad to have you back! Did you finish with your yard work? I know it looks lovely! It was chilly and rainy here this morning, but the sun has come out this afternoon, and it’s quite nice out now! Take care!! God bless!! I love Tyson chicken! I haven’t tried the grilled strips yet, but we love to buy the nuggets and also the buffalo tenders! Great for quick dinners, lunches or dinners when my nieces come over. I love the buffalo tenders chopped up in a nice green salad with some ranch dressing! Mmmmm! I’m hosting a giveaway at my blog, check it out! What a great giveaway! My family could really use this! It would help out with our groceries a lot! Plus I would love to make some chicken fajitas!